With Chinese people's growing enthusiasm for pet ownership, the domestic pet market has been growing quickly over the last few years. Some segments of the market, such as pet breeding, are generating huge profits. But others, like pet stores, are under a lot of pressure due to fierce competition. Some investors have tried to explore new market segments by providing distinctive high-end pet services, which analysts said might be the future of the domestic pet care industry. Shanghai resident Dai Yaping devotes about one-seventh of her monthly pension to her poodle, Trumpet. Every month, she spends 400 yuan ($60.20) to take Trumpet for his weekly wash and grooming session at a local pet store. She also feeds him imported dog food. Although it is more expensive than domestic brands, Dai believes it is far better for Trumpet's skin disorder. In Dai's neighborhood, almost half of the families own at least one pet, and many spend way more than she does on their animals. "One of my neighbors hired a special nanny to take care of her dog; another sent her dog to a training school, which costs about 5,000 yuan and one neighbor, who owns a Tibetan mastiff, built a small hut with an air conditioner for the dog," Dai said. Dai and her neighbors are some of the millions of pet owners turning China's pet industry into one of the fastest growing in the world. China's passion for pets has spurred a pet market that appears unaffected by the country's slowing economy. Forbes reported in March that there are about 27 million pet dogs in China, more than any other country except the US and Brazil. China's pet care industry is also blowing up. According to a Reuters report in June 2015, experts predict the industry will grow by more than 50 percent to be worth 15.8 billion yuan by 2019, outpacing the world's largest pet care market - the US. "China's pet care industry exploded around 2003, and has been on the rise ever since," said Cen Bingwen, secretary-general of the Dongguan Pet Industry Association. "However, the industry is struggling from cut-throat competition and over-investment from companies in other industries. 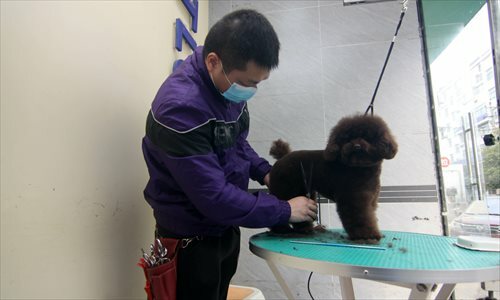 In China, many pet-related industries, both online and offline, have sprung up in recent years, such as breeding, veterinary services, pet supplies and pet services, such as grooming and training. According to Cen, some of those industries are making huge profits, especially pet trading. "I have some friends who are breeders. They told me that it typically costs about 800 yuan to 1,200 yuan to raise a dog that can sell for 2,000 yuan to 3,500 yuan," Cen said. Many companies in the pet trading industry are still gaining increasing popularity among investors. For example, qichong. com, an online pet trading platform, announced in June that it gained 3 million worth of investment, mt.sohu.com reported in June. But Zhang Min, who works for the US pet store chain Petland in Shanghai, told the Global Times on Monday that the domestic pet trading market is "unbalanced" and a pet's price may balloon four or five times if it's sold in a pet store rather than at a pet trading market. However, pet sellers take on a lot of risk selling pets, whose value can change dramatically in a short period of time. "For example, a poodle used to cost more than 10,000 yuan a couple of years ago, but the price has since fallen by about a half," Zhang said. While things look good for breeding and veterinary services, other pet businesses have to fight for profits in an increasingly competitive environment. Big investors, both foreign and domestic, are looking to take a bite out the Chinese pet market, Cen said. Some have no experience with pets and are just throwing money at the industry hoping to earn quick profits. Several multinationals, including Nestle SA and Procter & Gamble Co, have eagerly entered the domestic pet care market, Reuters reported. With some much investment pouring in, many independent pet stores in Dongguan, South China's Guangdong Province, have been bought up or have shut down, Cen said. Even the big dogs are having a hard time in the saturated Chinese pet care market. The single-floor Petland store in Shanghai used to be much larger, with multiple floors, said a store manager surnamed Xie, who did not want to disclose her full name. Xie said that some nearby pet stores that had been doing well have shut down in recent years. "I think the pet shop market is more or less saturated," said Zhang, the Petland employee. "It is hard to find a neighborhood in Shanghai without at least one pet store." To avoid the fierce competition that always arises for an easily copied business, some entrepreneurs have explored new ventures that target the upper-end of the pet care market. Shanghai resident Qi Jing got the idea for her pet hotel, which she opened in July 2015, after she noticed that the city was full of pets stores, but lacked a proper kennel. Qi's hotel goes well beyond typical kennel services. The pets sleep in glass rooms complete with cots, mattresses and sheets. They are monitored around the clock and can take swimming classes and visit the hotel's spa. "The kennel market is growing," Qi said. "Many foreign customers told us that there are a lot of places like ours in their countries. But in China, they are desperate to find one." Yet more entrepreneurs are trying to get a foothold in the market. "People have come from as far away as Chifeng, North China's Inner Mongolia Autonomous Region, to talk to us about opening a similar pet hotel [in their hometown]," she said. "The pet hotel's operating cost are high, but the business has started generating profits in recent months." Other niche pet services, such as pet matchmaking, pet photography and door-to-door pet housekeeping have also emerged in China. "In the future, the markets for pet welfare and pet healthcare are sure to expand," Cen said. Still, he noted China's pet care market remains "20 years behind that of the US." According to a July report by the data publishing platform iimedia.cn, 62 percent of the US families own pets, compared with about only 15 percent in China's first-tier cities.